Chikballapur is the district headquarters of the new Chikballapur district of Karnataka. This district, which was previously a part of Kolar district, has many fascinating tourist attractions. Chikballapur town lies about 50 km from Bangalore and is the district headquarters of the Chikballapur district. This district is the birthplace of the engineer/statesman, Sri Visvesvaraya, and is an educational centre, with many existing and proposed educational institutions like the IIT Muddenahalli, The Visvesvaraya Institute of Advanced Technology and the Sri Sathya Sai Baba University. 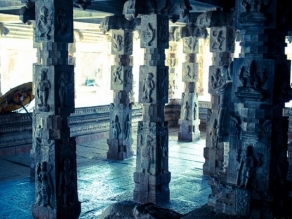 Chikballapur has many natural attractions and man-made monuments that attract tourists here. The famous Nandi Hills is located in the Chikballapur Taluk. The Yoga Nandeeshwara Temple, on top of the hill, and the Bhoga Nandeeshwara Temple, in the village at the base of the hill, are the main attractions here. The Vivekananda Waterfalls, about 12 km from Chikballapur town, is a beautiful place with the cascade at its best after the rains. Rangasthala, which is also located near Chikballapur, has a beautiful temple with a splendid black stone, Vijayanagara style statue of Lord Vishnu. Muddenahalli, which is also located near the region, is the hometown of Visvesvaraya and his house is now preserved as a museum. There are other places of interest like the Subramanya Swamy Temple at Chitravati, the Ellode Sri Lakshmi Adinarayana Swamy Temple and the Kandavara Lake. Some of the hills offer opportunities for rock climbing and mountaineering activities. Thanks to its proximity to the main city of Bangalore, commute to Chikballapur is never a problem as there are many options available for tourists through road and rail. Regular private (non air-conditioned) and state buses for Chikballapur are available from Bangalore. Tourists can avail KSRTC (Karnataka State Road Transport Corporation) buses, which are comfortable and reasonable. Taxis and bikes are also available on hire to visit Chikballapur.